Every year, our nation generates over 70 million tons of scrap material that – if not recycled- could end up in landfills. Converting this scrap metal into a valuable replacement for virgin raw materials, while still protecting the environment, takes more than hard work. It takes the most innovative technology available. Which is exactly what you’ll find at all of our recycling facilities. Our patented on-line bulk scrap analyzers accurately determine the chemistry of scrap grades, reducing the variability in scrap charges. These analyzers allow us to certify the content of key elements critical to our customers. Time and again, we’ve been recognized in the industry for providing better quality, value-added products. Do you want to learn more about the shredding process at our Orlando, Florida facility? Click below to watch a brief video. Trademark Metals Recycling provides recycling solutions to the Southeast auto wrecking industry, and operates car crushing crews throughout Florida. These crews use environmentally sound work practices to ensure that we are in compliance with the latest environmental standards. And we continually monitor market conditions to pay you fair, competitive scrap metal prices. Please note: Gasoline and free flowing liquid disposal requirements vary by location. Call your nearest Trademark Metals Recycling for more details. Trademark Metals Recycling has mobile baling crews across Florida;to assist the public and private sector with ecologically sound and economically productive metal recycling. Our mobile crews employ the latest in mobile baling equipment to ensure that the job is done quickly, and with minimal interruption. Trademark Metals Recycling’s crews have the experience, equipment, and authorization to safely provide demolition services for industrial plants, with each crew member having completed current OSHA (Occupational Safety and Health Administration) training and certification. We’re always at the ready to structure a custom plan that meets your plant’s demolition and clean-up requirements, no matter how large or small the job. TMR also offers a comprehensive railcar dismantling service. It’s simple. We buy your railcar. When the car is no longer usable, we proceed with the dismantling. 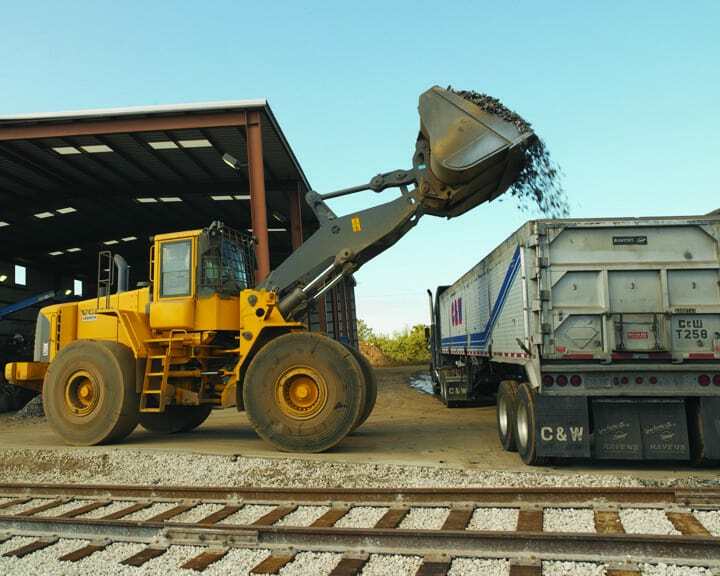 Hoppers, tanks, flats, gondolas, covered hoppers, auto racks, intermodal cars…we dismantle them all. When you need containers for scrap collection and pickup and an experienced team of dispatchers,Trademark Metals Recycling is here to serve you. Logistics to transportation, we’ll arrange for reliable and efficient scrap shipment from your scrap yard or manufacturing facility to one of our 23 recycling plants. Call 1-888-316-4471 or email TMRDispatch@DJJ.com for your custom container service requests. We use kiosk touch screens in our warehouse that are tied to the scales. These kiosks generate a bar coded ticket that you take to the cashier for prompt payment of your nonferrous materials. It’s a streamlined system that eliminates manual paperwork, and speeds up the purchasing and payment process for each customer. Trademark Metals Recycling provides service to the public and private sector with ecologically sound and economically productive metal recycling from municipal solid waste. Our experienced team provides expert advice on proper metal sorting and segregation in an effort to divert as much material away from landfills as possible for recycling. Trademark Metals Recycling provides ferrous and nonferrous landfill services for many Florida communities. TMR crews remove white goods, shreddable tin, and a host of other shreddable material from landfills. The TMR staff transports the scrap from landfills to one of our yards for processing and recycling. By providing these landfill services, TMR helps maximize the volume of metals recovered and recycled, preserving and protecting our environment. TMR’s staff removes all CFC’s, refrigerants, capacitors, and other harmful components found in some white goods prior to shredding. TMR always operates in full compliance with all environmental regulations. The Company has long been a supporter of the communities in which we operate. Trademark’s facilities play an essential role in preserving our environment. We annually recycle millions of tons of materials that might otherwise be discarded, and some of this scrap originally made its way to a landfill.